I love chocolate, but I learned early on that I love it dark. 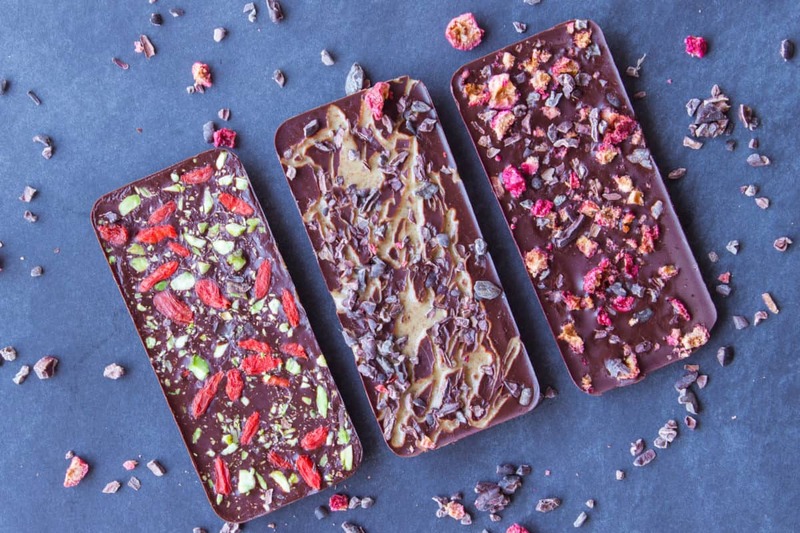 I’m not a milk chocolate girl (and probably never will be, being vegan) and have always embraced a bittersweet bar. There’s just something decadent about the strong, heady taste of cacao. If you’re like me and love the taste of unadulterated cacao, this 3 Ingredient Sugar-free Chocolate is for you. Made with only cacao, coconut butter and coconut oil, it’s incredibly easy to make and (taking 15 mins). Having been on an anti-Candida diet for most of the last year, I struggled to find snacks that were low in sugar and carbs, while also being healthy and not containing refined ingredients. So I was absolutely delighted to come up with this whole food version of one of my favourite treats! This 3 Ingredient Sugar-free Chocolate is absolutely delicious, but be warned: it is bitter. I use goji berries when I make it to help sweeten it, but if the idea of really bittersweet chocolate is off-putting to you I recommend adding a little maple syrup. 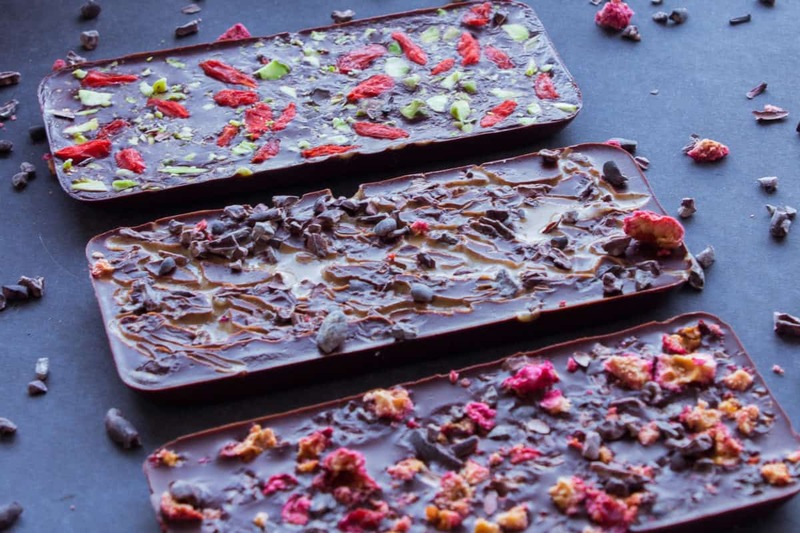 Feel free to add any toppings you like to this chocolate and get creative when you make it. Part of the fun is playing with different flavour combinations! I’ve listed my favourites in the recipe below but there are so many to try – use your imagination! I love orange-flavoured chocolate with pistachios and gojis, or salted almond butter with cacao nibs. 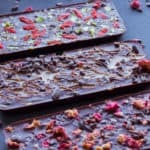 Because of the pretty toppings, this 3 Ingredient Sugar-free Chocolate also makes a really unique gift. One note of warning here, however. Unlike regular chocolate, due to the coconut oil content IT WILL MELT at room temperature. Because of this, store it in the fridge or freezer until ready to eat (or give). Enjoy! This vegan, gluten-free and sugar-free chocolate is the perfect easy and healthy dessert. Made with coconut oil, enjoy it as a guilt-free, low carb snack at any time. Add the coconut butter and oil to a small saucepan and melt on the lowest possible heat on your stovetop. Remove the saucepan from the stove, add the cacao powder (and maple syrup if using for sweetness) and stir the mixture well. Keep stirring! The mixture will be lumpy at first but if you give it a couple of minutes, it will become smooth. If using vanilla powder and/or orange/pepperment oils, add them here and stir into the chocolate. Pour the chocolate evenly into chocolate moulds. You can also use plastic food storage containers, small baking tins, or ice cube trays! Decorate the chocolate with any of the optional ingredients above. 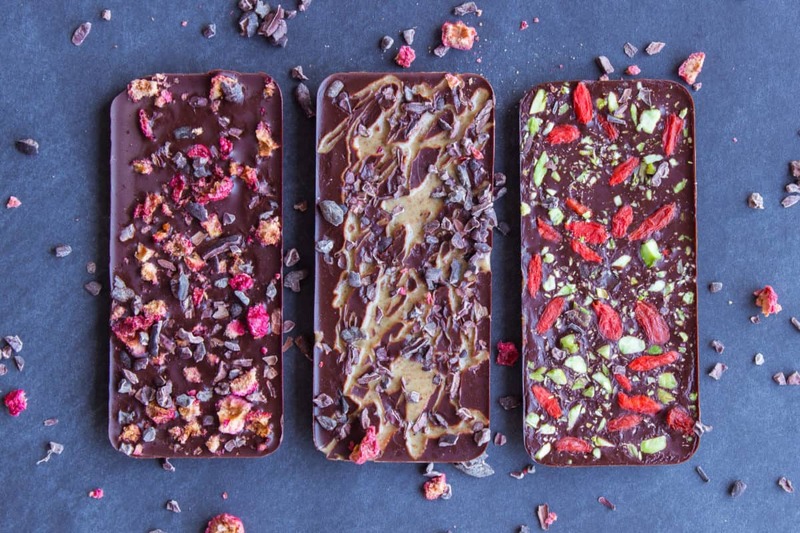 I personally really like to use goji berries or some form of dried fruit, because it gives the chocolate some much-needed sweetness! Once you're happy with your designs, freeze the chocolate for 15 minutes. Remove from moulds/trays/containers and eat! Note: this chocolate will begin to melt at room temperature. It must be stored in the fridge or freezer to stay solid. Looking for more low sugar and low carb dessert recipes? Try my Raw Walnut Brownies, Chocolate Hazelnut Freezer Cookies or Coconut & Goji Energy Bites.